As I child, I remember hearing the news about the presidential campaign of 1960. People made a big deal of the fact that John F. Kennedy–the Democrat running against Richard Nixon–was Catholic. Like there was something wrong with that? Apparently back then, yes. It didn’t even occur to me that bigotry of that sort could even exist. White on white bigotry? Didn’t make sense. But then I was a poor Filipino kid in San Francisco with a rudimentary understanding of politics at age 5, my kindergarten year. All I knew by baptism I was Catholic. And so was Kennedy. He may have been white, but he was just like me where it counted–deep inside. And if he could be president, I figured then I could too. I just found it odd that before Kennedy, there had never been a Catholic president ever. Fast forward to the present, as we approach the week of Pope Francis’ visit to the U.S., religious bigotry has become a hot topic in the presidential campaign. If you wondered when all the birther stuff that Trump had trumpeted in the past would surface like a dormant cancer, all it took was a question at a New Hampshire town hall. We could tell by Trump’s reaction that he heard the question. But he let the man continue. Trump said he’d look into it. But he did not offer a rebuttal on the anti-Muslim comments. Neither did he stand up for the truth, nor try to correct the questioner. Later, Trump tweeted he was under no “moral obligation” to defend the president. How would a President Trump defend your freedoms? Later on NBC’s “Meet the Press,” Trump was asked how he’d feel if a Muslim were elected president, a possibility given Muslim Americans are one of the fastest growing groups in the U.S., expected to grow to more than 6 million by 2030. Now there’s a lesson in how to mask a bigoted remark with a slightly less bigoted remark, in an attempt to make your bigotry acceptable. Then there was GOP candidate Ben Carson, who had his own Trump cards to play this morning when asked about the possibility of a Muslim president. Hmm. But should a president’s religion matter? 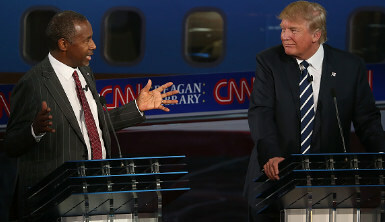 When asked if he believed Islam is consistent with the Constitution, Carson said he didn’t. But Congress was “a different story,” he added. Naturally, that brought a strong rebuke from one of the country’s two Muslim members of Congress–Rep. Keith Ellison (D-MN). It’s a shame that we’re talking about these issues that for some may seem tangential to the real issues of the economy, jobs, and all that wonky stuff. But you must agree, at this stage in the game, these are real issues. It’s useful to weed out the bigots from the group of hopefuls who want to lead America. We need people to agree that all good Americans can grow up to be president. Even someone like a John F. Kennedy in 1960. All this religious freedom talk should prepare you for Pope Francis’ descent on America. He sure won’t be sounding like what passes for religious leadership in America—the sound of right-wing religious zealotry. But we already know this pope is different. First, some numbers about the Asian Americans in his flock. By demographics (from the June 2014 Cultural Diversity survey from Georgetown University), whites are 54 percent of U.S. Catholics, at 42.5 million. Hispanics are next at 38 percent or 29.7 million. Asian American, Native Hawaiian, Pacific Islanders are at 4 percent or 3 million. African Americans are at 3 percent, or 2 million. American Indians and Alaskans number 536,601 or 1 percent. At four percent, Asian Americans are a tiny number among total Catholics. Right now, on any given Sunday, there are masses said in more than 30 Asian languages, from Tagalog and Vietnamese to Chuukese and Hawaiian. 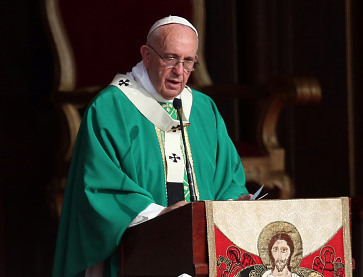 Pope Francis is leader of the largest Christian church that numbers more than 1.2 billion worldwide. And I think the surprise will be how much he will talk about the world as our “common home” and the need to protect it. In his encyclical in June, Francis took on climate change and the environment in a way you’ll never see from conservative Christian persons of faith in America. They usually ignore science in the name of faith. Francis isn’t like that, and his message should be an eye-opener to those who play the climate change game in the same old political way. It’s pope as politician and world leader, not just as galvanizing religious figure.